The Collins Press, Cork. 1991. 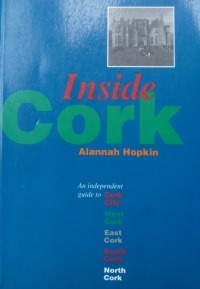 Probably the most thorough guide to Cork City and County ever written, this was one of the first books from the Collins Press, now a major figure in Irish publishing. I wanted to use the expertise that I had gained while working for Time Out in London, and New York-based Fodor’s Travel Guides to produce the best possible guide to my home territory. It was researched independently with no sponsorship, and contains comprehensive touring information, historical background and descriptions of all the major attractions, and many lesser-known ones. It is also a guide to the hospitality that was available in the area in 1992, its year of publication, which will be cause for nostalgia among older readers. The intention was to update it every so often, and produce new editions, but in the end there was only ever one edition, and it is now a collector’s item.